World over, people are becoming more environment conscious, and there is a greater awareness on conserving the environment, and reducing pollution. Small changes that we can incorporate in our daily life can make a great impact on the environment. It’s not about how much we have conserved, or how less have we polluted, but it’s all about the conscious effort we need to make in all our actions. Little actions can make us do our bit to the save nature, and a chain of such actions can lead to multiplied results, a greener environment, and most importantly-increase awareness. Even since the advent of computers, the old fashioned files and folders have made way to databases and emails. We are now more used to communicate through emails then by letters, we see more of news online then by reading a paper. We see more advertisements in our email folders then in handbills. A digital signature validates our online credentials just as a signature on a paper would do. We extensively use internet banking, reducing our visits to the bank. All of them are proof of the way we are slowly replacing paper as our chosen means of communication. 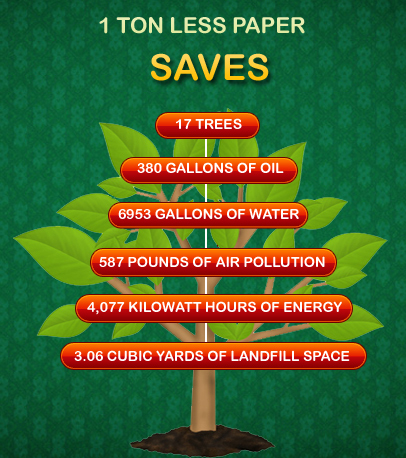 Lesser paper usage means lesser cutting of trees, lesser paper making plants which means less energy consumption, and lesser pollution. Also lesser cost of transportation saves fuel too. Indirectly, such initiatives by us help conserve the environment by protecting trees, help decrease energy consumption either by usage of machinery or transport and when that is done, we pollute the environment in a lesser way. So for all of you readers reading this post online-you too are doing a part in saving the environment. It’s not an exaggeration to say that we have almost given up on writing letters and communicating by paper, except in situations where they are mandatory. However, this only means that we are conserving our green resources, but are also using other energy sources instead which still need a fuel to run on. We cannot also compare the usage of energy sources against conservation of nature, as they are two different entities. But the energy used in writing an email or doing a money transfer online is much lesser when compared to driving to an office and doing a paper transaction. Hence, we must in all our daily routines, whether personal or business, decrease paper consumption wherever possible, and do our part to save nature. So… for all you email and internet aficionados—you might have saved many tress till date. However, the global demand for paper, after removing the recycled components is a staggering 400 million tons- which means about 4 billion trees being felled. The best we can do is to further reduce our paper consumption, move towards using the digital media for advertizing and communication, and lastly-plant as many trees as possible, so we have the correct ecological balance.